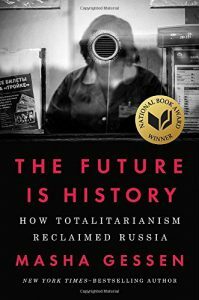 Just over a month ago, on November 15, Masha Gessen’s The Future is History: How Totalitarianism Reclaimed Russia won the 2017 National Book Award for Nonfiction. Since my knowledge about Russia, which has been omnipresent in the news lately, is lacking, and since I’ve had positive experiences with nonfiction National Book Award winners in the past, I tracked down a copy. I’ve been working my way through it ever since. Gessen, a journalist and LGBT rights activist, was born in Russia in 1967 and immigrated to the United States with her parents and siblings in 1981. After the collapse of the Soviet Union in 1991, she returned to Moscow, eager to report on new freedoms and opportunities in what appeared to be an emerging democracy. She returned to the United States in 2013, when anti-gay legislation and rhetoric posed a serious threat to her, personally, and to her rights as a gay parent. I’m usually all about the personal stories used to bring historical and political nonfiction to life. In The Future is History, however, I’m actually more taken with the expository writing that appears between check-ins with Gessen’s protagonists. That’s because Gessen, with her reporter’s background, is just so good at explaining complicated social, political, and historical dynamics. There’s no way to provide an adequate synopsis of this book’s content in a six-paragraph blog post. But, if you’re like me and have only superficial knowledge of the subject matter, I can almost guarantee that time spent with The Future is History will pay huge dividends in terms of your Russian literacy. And given the current news cycle, you will start reaping the rewards immediately. My investment has paid off several times already – and that’s just in the last week!